At the origin 1st beer of the year, exit of last hop and barley harvests, the beer Mars draws its force and its consistency of a flowered and fruity soil. Its semi-sparkling fairness and its original taste made its success so much so that we produce it all year. Brewed with hemp. 24/02/2011 - 33cl bottle @ home - BB: 2013 (2011-64) Thanks to Klaas for the bottle! Somewhat cloudy dark amber to brown beer. Practically no head. Aroma: sweet, spices, ginger. MF: little carbon, light body, very watery. Taste: little sweet, spices, herbs, some herbal bitterness. Somewhat like Ricola herb candy. Aftertaste: a little bitter and ginger like, prickling the tongue. I guess it’s ok if you’re up in the mountains and your only alternative is Kronenbourg. Bottled 330ml. -Pale amber coloured, small white head, intensive and not so pleasant peppery cactus nose. Quite odd dry taste that reminds me on milder tear gas or peppery bomb with notes of basil. Interesting but WTF is this? Probably unique beer of a kind. It poured a dull golden-amber body with a small white head that went away fast. Fizzy. Unidentifiable sweet fruity aroma, slightly dusty, slightly acidic. It’s unlike any hemp that I’ve ever smelled. The taste is basil turning to salt going who knows where, kinda aromatic, perfumey even, acidic aftertaste. Just strange. Eeh. La prochaine fois, j’mettrai ma cagoule. Bottled. More amber than blonde coloured with a short-lived off white head. Sadly infected. The aroma has signs of reasonable hoppiness around a soapy sourness. This is replicated in the taste. The fruits are a hybrid of oranges and berries but the soapy flavours dominate and spoil. Very disappointing. 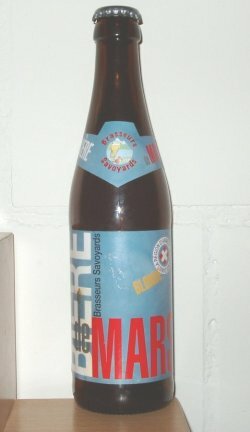 An orange beer with sediment of yeast floating around underneath a white head. The aroma is of straw and caramel, while the flavor is sweet with notes of caramel and malt. Bottle. Golden coloured with lots of floaties and an off white head. Aroma of caramel and ascorbic acid. Flavour of malts and caramel with notes of fruits and hops. Deep blond color. Strange aroma of honey candies, malt. Good malty body, round. Pleasant.